3nh produced color measuring spectrophotometer two series, one is NS series handheld spectrophotometer, the other is YS series portable spectrophotometer. They are 45/0 and d/8 optical structure, common angles reflectance spectrophotometers. Spectrophotometers are color measurement devices used to capture and evaluate color. As part of a color control program, brand owners and designers use them to specify and communicate color, and manufacturers use them to monitor color accuracy throughout production. 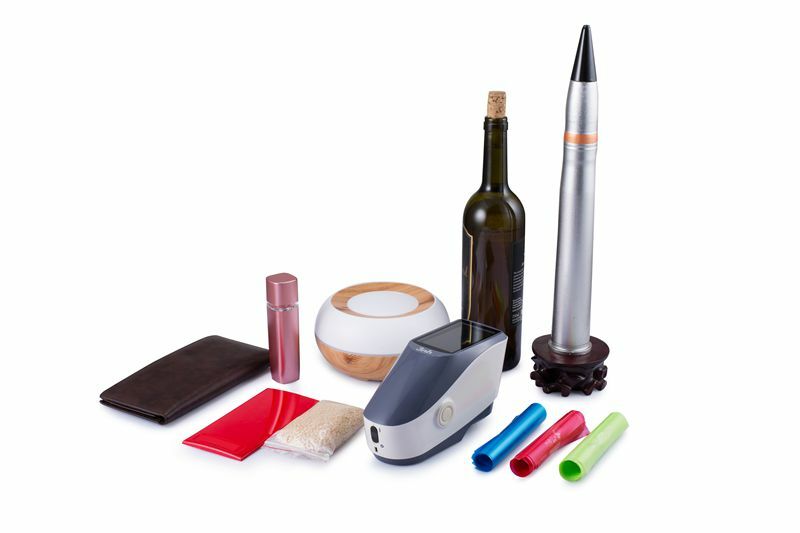 Color measuring spectrophotometers can measure just about anything, including liquids, plastics, paper, metal and fabrics, and help ensure that color remains consistent from conception to delivery. A color measurement spectrophotometer is an instrument designed for physical sample analysis via full spectrum color measurement. By providing wavelength-by-wavelength spectral analysis of a sample’s reflectance, absorbance, or transmittance properties, it produces precise data beyond that observable by the human eye. If desired, reflectance spectrophotometers can be used to calculate psychophysical colorimetric information as well. Spectrophotometers offer a higher level of flexibility and versatility than colorimeters due in part to the fact that they offer multiple illuminant/observer combinations and can operate in multiple geometric arrangements, including 45°/0° and d/8°. As such, spectrophotometers are capable of measuring metamerism, identifying colorant strength, analyzing a comprehensive range of sample types, and giving users a choice between including or excluding specular reflectance to account for geometric attributes. Full spectrum analysis also provides for greater specificity, potentially identifying color differences missed by colorimeters. Spectrophotometric instruments are ideally suited for a broad range of applications in the research and development phase, including color formulation and color system development, as well as color quality control throughout production. The most common color measuring spectrophotometer, this instrument measures light reflected at a fixed angle to the sample, usually 45˚, and can exclude gloss to most closely replicate how the human eye sees color. They are commonly used for measuring color on smooth or matte surfaces. Spherical Spectrophotometer can measure light reflected at all angles to calculate color measurements that closely match what a human eye would see. They are commonly used for measuring color that has been applied to textured surfaces such as textiles, carpets and plastics, as well as shiny or mirror-like surfaces, including metallic inks, printing over foil, and other highly glossy surfaces. Multi-Angle Spectrophotometer views the color of a sample as if it is being moved back and forth, just as you would twist a sample to see the color at various angles. Today’s multi-angle instruments are used for specially coated pigments and special effect colors with additives such as mica and pearlescents, such as nail polish and automotive coatings. 3nh produced color measuring spectrophotometer two series, one is NS series handheld spectrophotometer, the other is YS series portable spectrophotometer. They are 45/0 and d/8 optical structure, common angles. If you need any model of color measurement spectrophotometer please click here to choose your model.